Well, today is an auspicious day and not just because it’s National Praline Day (more about that later,) today is our last rabbit hole adventure! Yes, as of Monday midnight when the link up closes, Jess, Shari, Paula and I will be hanging up our rabbit holing hats and closing the doors to the rabbit hole forever. It’s not been an easy decision to make, because I’ve been loving on this Saturday morning link up from the very beginning. The rabbit hole was Karin’s brainchild and then me, Shannon and Jess came along for the ride. Then when Jess and Shannon retired from piloting duties, Paula stepped up to the plate and when Karin, retired, Jess and Shari joined the team. It has been SO much fun (and I am not sorry for shouting) but blogging is not my job, it’s my hobby and it’s time for me to redress ye olde blog-life balance and if I’m honest, I’m looking forward to getting my weekends back. I shall likely still hunt you down via the interwebs though, because I can’t be without my weekend reads! The show must go on though! So let’s hop to it and check out all the lovely links! Today is National Praline Day! Can I tempt you with some White Chocolate and Macadamia Cupcakes, this Apple Praline Bread or how about this Pecan Praline Cheesecake? YUM! If you love free stuff and more to the point, you love stuff that is going to add value, check out these awesome free printables with everything from meal planning to school holiday rules, plus some value added rhyming animal expressions, there’s a printable that’s fun for everyone. My trainer has just bought her first family home and this means she’s just “enjoyed” first ever visit to IKEA at the tender age of 46. I saw her FB update yesterday and it said “lost in IKEA!” Been there, done that, and got the T-shirt! I should have sent her these 16 Creative IKEA Hacks – they’re just genius. One of my all time favourite quotes is from Adlai E Stevenson, “it’s not the years in your life but it’s the life in your years that count,” and since my cancer diagnoses, I’ve lived by those words. I already have a list of 101 Things To Do in 1001 Days but after reading the story of Helen Fawkes, I’m thinking we could all do with a list for Living Life in Full. While we’re on the subject of living life in full, let’s add living life in colour to the list! Our place is so brown, I have (un)affectionately named it Brown Town. I think I need to take some decorating tips from the woman who has such a colourful apartment, it would surely make unicorns jealous! I want to live in a rainbow apartment too! Talking of working out, have you seen the Squat Your Dog Challenge? I can’t think of a more adorable way to work out, although I think you’d need a pony sized pooch to see the results! As it’s the rabbit hole’s last hurrah, I’m sharing some of last week’s lovely links first shared by my trusty co-hosts, Jess, Paula and Shari. Jess shared these 25 30 seconds ways to have a healthy morning, Paula shared these Simple Habits for an Organised Home and I think the 32 Best Netflix Original Series that Shari shared are going to come in very handy! Before I sign off, I’d just like to give a massive shout out and a big high five to my trusty co-pilots past and present and all our bunny models, Oreo, Bubbles, Freckles, Hashbrown, Gatsby, Bowie Bonbon, Lord Carrot, Daisy, Ellie and Lola. I must also thank all you lovely linkers who have made the rabbit hole such a magic place to be. Thanks for sharing all your lovely links, cracking comments and sharing some of your weekend with us. It’s been amazeballs! So tell me, what would be top of your Living Life in Full list? Do you like a pop of colour too? Are you a fan of IKEA too? Do you suffer from “tomato face” after working out too? What’s on your weekend agenda? 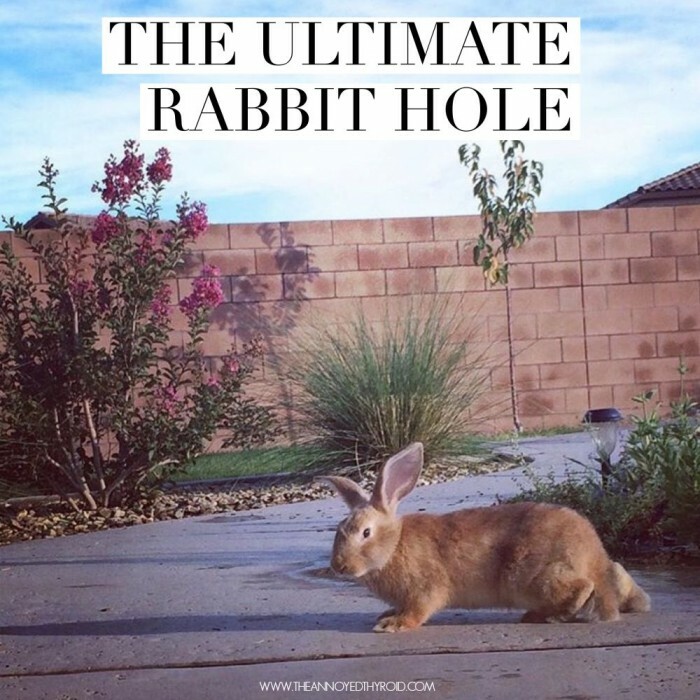 One last time, we will open up the rabbit hole link up for bloggers to add their link list posts or even just their favourite post (if you are not of the link list kind) for the week. Please link only one post. This makes it fair for everyone and allows more posts to be read. Talking of reading, do try and pop along to say howdee to some of the other lovely linkers and my awesome co-hosts. You can link up here or bob on over and say hello to Paula at The Geeky Shopaholic, Jess at Confident Life and Shari at Good Food Week. It doesn’t matter where you add your link because it will appear on all four blogs, as if by magic! The link up will stay open until midnight on Monday.